You can buy starters on line, usually in dehydrated form. You can get them at Cultures For Health (where I bought mine) or other sites. Or, someone that already has a starter can give you a small amount and you can grow it. If you live near me (Littleton, CO area), I can give you some. When you buy a dehydrated starter, it will come with instructions on how to bring it back to life. Once you’ve gone through whatever instructions came with your new, dehydrated starter, you will need to feed that starter on a regular basis. I recommend keeping your starter in the fridge, which will slow down the yeasts’ metabolism so you don’t have to feed it so often. Yet, they are still alive and eating, so if you don’t feed them, they will starve to death. I keep my starter in a lidded quart canning jar. Once a week Il add 1/4 cup flour and 1/4 cup or less water, stir and place back in the fridge. It should be a pancake batter consistency. By the time I’m ready to make bread, I have a pint or more of starter in the jar. The morning before I plan to bake, I take the jar out of the fridge, feed it 1/4 c flour and 1/4 c water (more or less, to keep the consistency), mix well with a spoon, and leave it on the counter to bubble. I usually just leave the spoon in the jar since I’ll be using it throughout the day. In about 4 hours (usually around noon) it will have bubbled and risen a bit and then begin to settle down. At that point, I’ll add more flour and water, and then repeat around dinner time and the right before I got to bed. The next morning I’ll pour what starter I need into my bread mixing bowl. There only needs to be about 1/4 cup of starter in the jar. I’ll feed the jar of starter 1/2 c flour and 1/2 c water (more or less) and put it in the fridge for the next baking, feeding it once a week. Once I’ve mixed up my bread dough, I’ll let it sit in my oven, covered (and with the light on for warmth) to rise and bubble until ready for baking. See my bread recipe here for more instructions on the actual bread-making process. Note to self: Put sticky note on oven door while the dough is rising so no one accidentally turns the oven on. Hi, so I have to buy the starter to get some going initially? Can’t I make my own from scratch? Thanks. Hi Lori, I made my own starter years ago from potato water. You’d have to look on the internet for the recipe. But I didn’t have much luck. I suppose it depends on where you live, how many of the good wild yeasts are in the air. I’m in Colorado, it’s so dry here that I don’t think we have as much good stuff in the air, mostly dust, lol. There are other methods to make your own starter, but the best luck I’ve had has been with the starter I bought from Cultures for Health. I’m sure there are other places you can buy some, either locally or Google sour dough starters. Here is my recipe for wild yeast starter: No commercial yeast,the wild yeast comes from the air. Pour 2cps of milk (whole or 2%) into a 2 qt crock, glass, or plastic container (no metal). Cover with a square of dbld chess cloth, and set it in a warm protected spot-a sunny window is great. Leave it there 24hrs. Stir in 2 cups of flour (preferably unbleached white), beating until smooth. Replace chesse cloth and set back in protected spot. If the weather is warm, the starter will begin working within one day or overnight, but if you have a cooler temp, the action may take 3 to 4 days. They say patients is a virtue. When it begins to bubble, allow it to “work ” about 2 days. Stir once each day with a rubber spatula. When the sponge is is thick, bubbly and has a fresh sour aroma, place a lid over the chesse cloth, label the jar, and refrigerate. Each time the starter is used, add 1 cup of warm milk and 1 cup of flour. Beat with a wire whisk until smooth, cover with the chesse cloth and leave overnight in a protected, warm spot. The next morning, stir the sponge with a rubber spatula and replace in the refrigerator. If this process is followed each time the starter is used, there will be no danger of losing it. Good luck! Jan; With all due respect, using milk is a big nono, with many of the microbials presenting as dangerous. 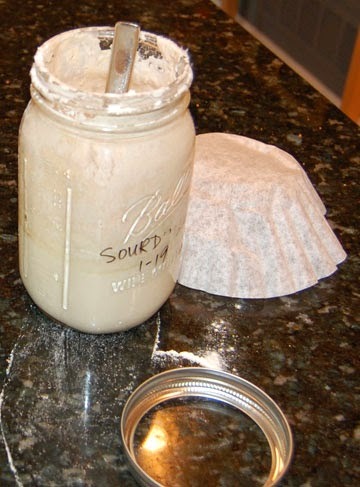 Good sour dough starter is maintained using water, some people use a little vinegar. Thus, with water, you have a pure base. Milk contains a lot of fat and proteins. Good for those who are allergic to dairy products or are vegans. Thanks for your input Barb! There are a variety of recipes for starters on the internet. Some do use milk or yogurt with live cultures, others just use rye and wheat flour and water. Unless you’re using raw milk, store-bought milk has been pasteurized so I would think there’s not too much in the way of microbes unless it’s been contaminated. For me, I prefer just buying the starter from a reputable store. It’s insurance that you’ll get a good starter and a very small investment (less than $10) for a starter you can keep and share with others for the rest of your life. I have never used this sour dough starter before but am willing to try any way I do not have a machine to mix the ingredients can I use a hand mixer to do this also will I need to have the water at 110 degrees for the yeast to ferment. Hi Randolph, personally I wouldn’t use a hand mixer, you don’t need it and it would be extra cleanup. Honestly, what I do is throw 3 cups of flour into the big bowl, pour in my starter and salt, add three more cups of flour on top, the water and then mix with a big wooden spoon. It takes less than 10 minutes and the only cleanup is the spoon. You don’t use yeast at all with sourdough starter, the starter has wild yeasts already in it. The sourdough starter is wet, like pancake batter. Just let the bread batter sit covered in a warm place for 8-12 hours. Hi Linzey, nice to meet you too! What took you so long, lol? Yes, sounds like we have a lot in common for sure. You’ll have to let me know how you do with the Einkorn. I used to buy the small bags in Wholefoods and then realized I could get 10 lb. bags from Jovial Foods for a better price. You might even want to try this biscuit recipe before you commit to bread. It’s very quick and easy and is to DIE FOR! https://theherbanfarmer.com/recipe/quick-einkorn-kefir-buttermilk-biscuits/ Jeez now I feel like making some tonight! I’m in Colorado Springs, is that close to you to get some starter? Hi Chris, I’m in Highlands Ranch. Is it worth driving up here? If you’re planning to come up this way at any time, or have a friend that’s planning to do so, let me know, I’ll be glad to share. You can email me at deb@theherbanfarmer.com. Otherwise, I bought my starter from Cultures for Health and there are probably other places on the internet as well. Hi Deb. Once you take your starter out of the refrigerator, one day before baking, do you feed it immediately, or do you allow it to come to room temp? Thanks!!! Glad to have come across you blog. There is very little out here in regards to einkorn sourdough. Hi Ana. I feed it immediately but I don’t think it makes a difference really. Glad you’re enjoying my blog! You can find a more about Einkorn wheat and recipes on the Jovial Foods web site. I’m a big sourdough fan and am currently working on perfecting an Einkorn sourdough rye bread recipe. Thanks so much for your prompt response!! I am not only new to sourdough but am committed to using the jovial einkorn. My first two loaves were comparable to bricks! I followed a typical recipe for sourdough, not realizing this ancient wheat was so unique, and kneaded my dough for at least 25 minutes while continually adding flour. Then… out of my saved sourdough starter in the refrigerator, which was full of bubbles, I fed only once before going to bed and had absolutely no activity in the morning. I still had some bubbly starter left in the fridge so I am following your directions and feeling hopeful!! I will get in three more feedings by days end!! I super appreciate this information Deb and your communication. You’re welcome! I would suggest this recipe https://theherbanfarmer.com/recipe/super-easy-no-knead-einkorn-sourdough-recipe/ . It’s the only SD bread I make these days. It’s so easy, takes me 10 minutes to mix up and it’s ready to bake 8 hours later. I’ve never had a failed loaf. This bread is denser and moister than breads made with added yeast. Deb…. thanks for this! I love bread, especially sourdough, but have been avoiding it because of the gluten, and then feeling guilty when I do eat it. My grandmother called bread ‘the staff of life’….she would know as she had to support a family when my grandfather died leaving her nothing during the depression. Ancient grain sourdough, the best of all worlds! When purchasing the dehydrated sourdough starter, I see now there are options (for example, a gluten free with brown rice flour, whole wheat, etc.) Which do you recommend for your einkorn sourdough no-knead recipe? Thanks. Many blessings! Glad you’re willing to give it a try! This is all I make any more, the no-knead recipe being my favorite. Just know that Einkorn is not gluten free, but it’s so pure that many people who are gluten-intolerant have no problem with it. Sometimes I think the problems come from the Roundup sprayed on American wheat crops right before harvest. Anyway, the starter I bought was the San Francisco Sourdough one. I was originally using organic wheat flour but switched it over to the Einkorn with no problem whatsoever. I even recently converted some over to rye wheat with no problem.